If they think of gum at all, most people picture chewing gum in its current colorful, sweet stick or Chiclets form, a totally synthetic product that is often found clinging to the bottom of one’s shoe. In truth, gum has a long history that cuts across centuries and cultures, starting with bark tar that was chewed nine thousand years ago in Neolithic Europe. It also derives from a widespread tradition of using natural plant exudates (waste products that are excreted from plant cells) for everything from incense to embalming, and as adhesives, lacquers, and sealants. The sapodillas, or chicozapote trees (Manilkara zapota) from which chicle is collected, are found in the Mexican states of Chiapas, Tabasco, Veracruz, Oaxaca, Michoacán, and Colima, although they grow best in the karst limestone region of northern Belize, the Petén region of Guatemala, and the Mexican states of Campeche, Yucatán, and Quintana Roo in the Yucatán Peninsula (Picture 2). The greatest concentration of indigenous sapodillas are found in Quintana Roo, and are probably the remnants of active cultivation by the ancient Maya or were simply spared by ancient farmers when they cleared the forests for their fields. 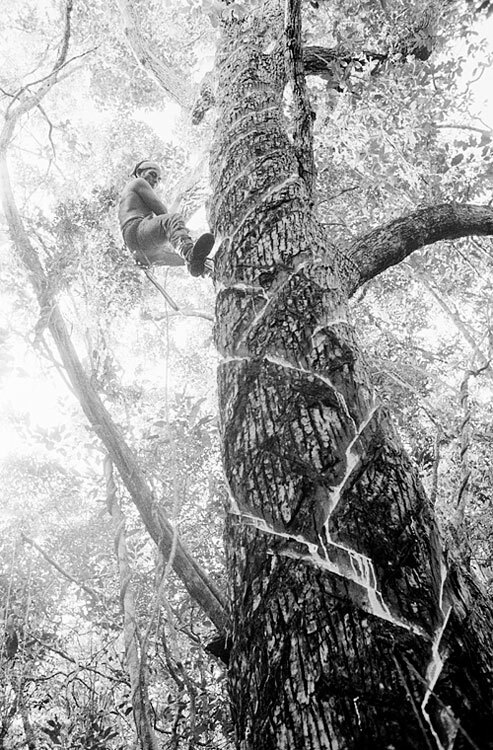 When the bark of the sapodilla is cut with a machete (a large knife that chicle extractors use) or attacked by insects or animals, the tree produces a milky fluid that forms a protective layer over the damaged area (Picture 3). It is this substance, known as chicle latex, that has been used for hundreds of years in the Americas as chewing gum. Natural latexes, such as chicle and rubber, are usually a white, thick liquid, although at times they can be clear, yellow, red, or orange and runny. Latex generally has no smell, which makes it quite different from plant resins such as pine tar and copal incense that contain oils, and have a strong scent. 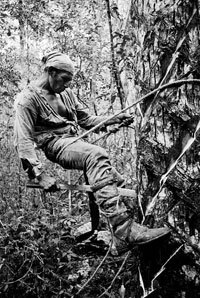 The contemporary Maya refer to the sapodilla tree as tzicte’ ya’, which I am roughly translating as “wounded noble tree.” This is a descriptive name that reflects the way in which the latex is obtained. 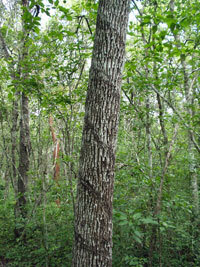 Chicleros (chicle extractors) harvest the chicle by cutting a machete into the flesh along the length of the tree in a zigzag pattern, and allowing the latex to run down the tree (Picture 4). 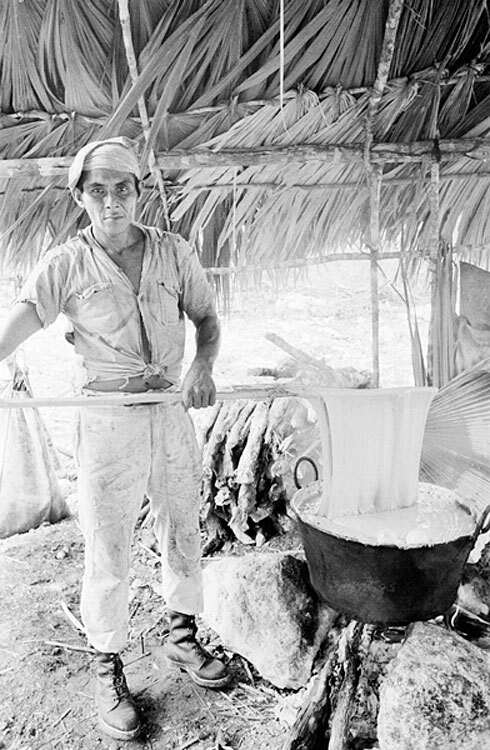 This is a process that the Maya have likely been using for hundreds, if not thousands of years, as the ancient Maya recognized that chewing this rubbery resin quenched thirst and staved off hunger. And the chewing of chicle [is] the preference, the privilege of little girls, the small girls, the young women. Also the mature women, the unmarried women use it; and all the women who [are] unmarried chew chicle in public. One’s wife also chews chicle, but not in public. Also the widowed and the old women do not, in public. . . . For this reason the women chew chicle: because thereby they cause their saliva to flow and thereby the mouths are scented; the mouth is given a pleasing taste. With it they dispel the bad odor of their mouths, or the bad smell of their teeth. Thus they chew chicle in order not to be detested. 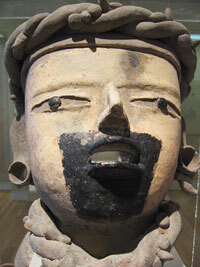 Aztec norms also strongly disapproved of gum chewing among men, particularly in public. Gum was even associated with Aztec gods. The goddess Tlazolteotl, who was known as the “Great Spinner and Weaver,” was associated with childbirth, healing, the moon, and witchcraft. In another guise, she was known as the “filth eater,” or Tlaelquanai, who ate a person’s sins to absolve them before death. She was frequently portrayed with bitumen on her face and around her mouth (Picture 6). Despite the shame that chewing gum brought its chewers, chicle seemed to be sold in the open market in Aztec society. 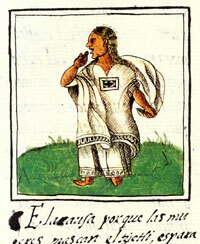 Sahagun describes the small-scale merchant who sold rabbit hair, gourd bowls, dyes, pigments, red ochre, herbs, copal, bitumen, possum tail, wild chicle, and chicle mixed with bitumen (tlaaxnelolli) in direct exchange for equally-valuable items or the Mesoamerican currency of cacao (chocolate) beans. Besides being chewed, chicle served other purposes in ancient times. 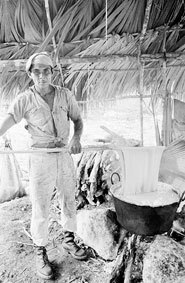 The ancient Maya sometimes mixed chicle and rubber with incense resin. For example, the copal remains dredged from the Cenote of Sacrifice at the site of Chichén Itzá in Yucatán, Mexico (Picture 7), were found wrapped in a layer of chicle and rubber. As chicle and rubber catch fire more easily than copal, researchers believe that the Maya did this to help the incense burn. 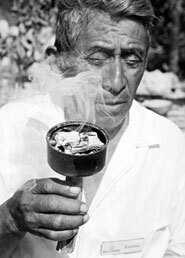 However, the Spanish bishop of Yucatán, Diego de Landa, also mentions in his sixteenth-century chronicles that chicle was sometimes used as incense in itself. Undoubtedly ancient peoples utilized chicle latex for many practical purposes such as an adhesive or sealant, but chroniclers failed to document these uses. The sapodilla tree is highly resistant to drought and heat and is known for its extreme longevity (Picture 8). 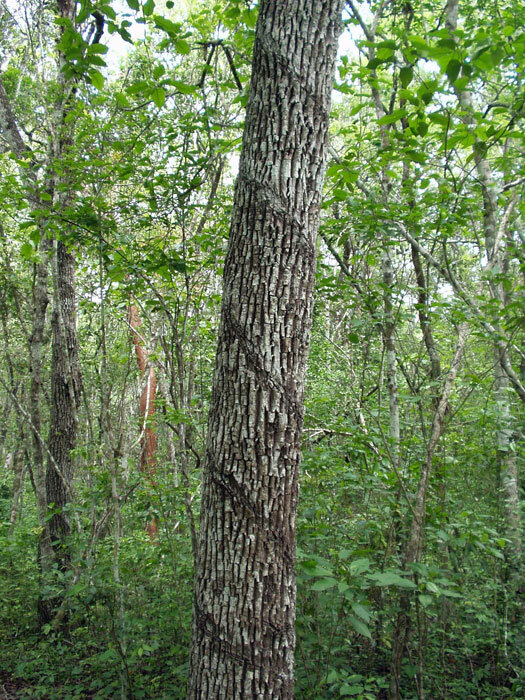 The ancient Maya, who referred to the tree as ha’as, prized the wood for its density and strength and used it widely, as many samples have been found in archaeological excavations. Whole seeds from the sapodilla tree have been found in middens (garbage dumps) at the ancient Maya sites of Colha in Belize and Tikal in Guatemala. Charcoal remains, presumably from firewood, have also been recovered at the Maya sites of Cuello, Wild Cane Caye, Pulltrouser Swamp, and Albion Island in Belize dating to the Preclassic (250 bc–ad 400) and Classic periods (ad 400–600). At the Maya site of Palenque in Chiapas, the zapote tree is depicted on the stone sarcophagus (a carved stone coffin) of the king Hanab-Pakal (Picture 9). 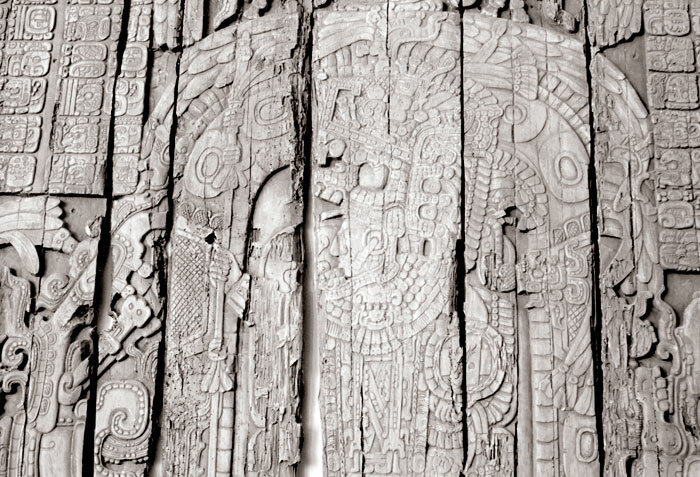 The sides of the sarcophagus are illustrated with a series of ten figures, representing the ancestral royal family of Palenque. 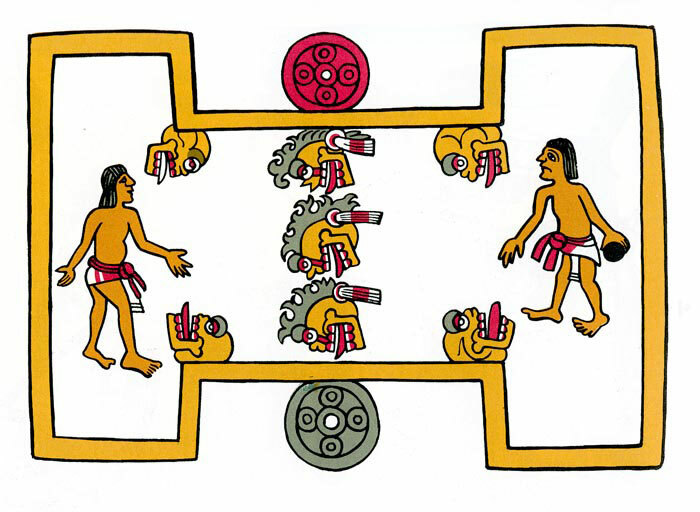 Each figure is shown wearing a headdress containing his or her name and associated with a valuable tree such as the avocado or cacao (chocolate), representing an “orchard of the ancestors.” Specifically, the image of K’an-Hok’-Chitam I shows the zapote tree emerging from behind him. 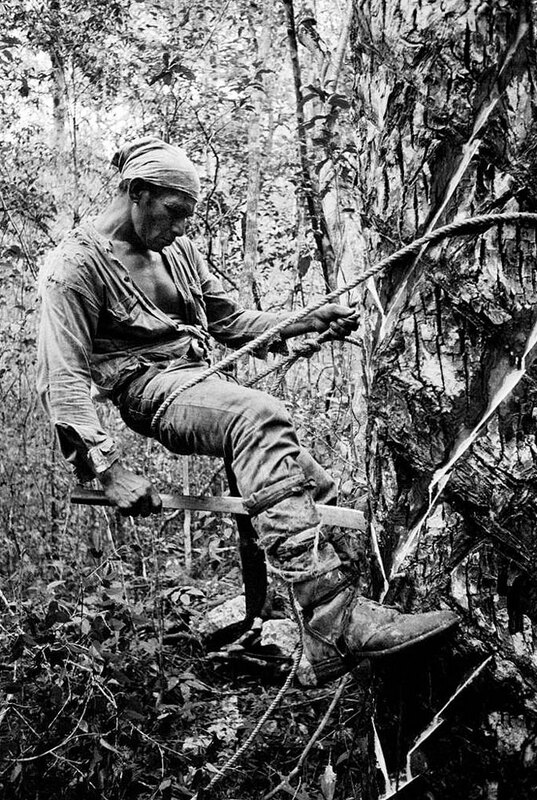 The wood of the zapote tree was also used to make boxes that would have held precious objects. The reddish wood of the tree, harder than even mahogany, was also preferred for making roof beams and carved lintels (support beams) in the buildings at Maya sites like Chichén Itzá and Tikal (Picture 10). The Aztecs also appreciated the hard quality of this wood, as Spanish chronicler Juan de Torquemada noted that when they made obsidian (volcanic glass) knives, workmen used hard wooden sticks to push flaked blades off the stone to make tools. 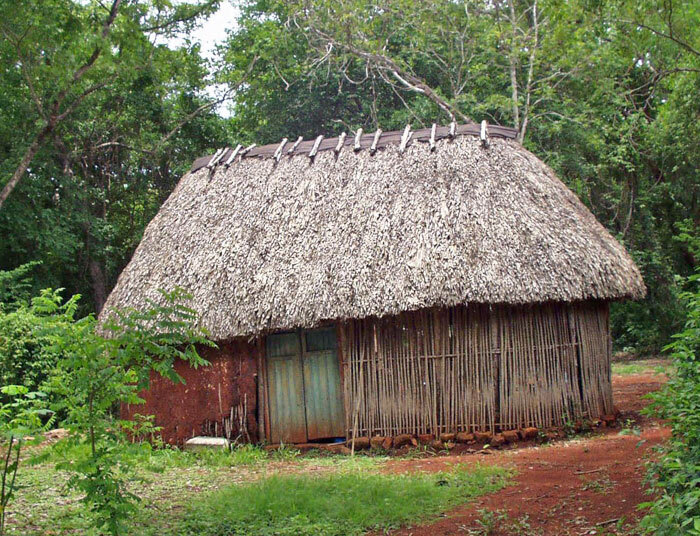 The sturdiness of this wood has made it a desirable resource for constructing the pole and thatch houses of Maya commoners for centuries (Picture 11). The sapodilla tree produces a sweet egg-shaped fruit known as “sapote” that was used as an ancient Maya and Aztec food source. The Spanish word sapote is corrupted from the Nahuatl term tzapotl, meaning “soft fruit,” and thus was used to refer to soft fruits in general. 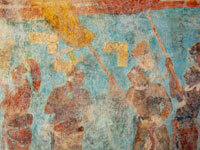 The Maya, on the other hand, used the term ya, which specifically references the chicozapote fruit. The fruit has a brown skin much like a kiwi, a soft orange- or brown-colored flesh with a grainy texture and dark, smooth-skinned seeds (Picture 12). After contact, the Spanish prized it for its sweetness and introduced it to the Old World. As was noted by Bishop Diego de Landa in his volume on Maya culture: “There is another very leafy and beautiful tree which never drops its leaves and without blossoming produces a fruit of as much and more sweetness than the one I have spoken of above, small, very sweet and delicious to eat and very delicate, and some are better than others and so much better that they would be highly prized if we had them here [in Spain].” (Picture 13) They also dried the fruit like prunes and were able to eat them year round, when other fruits were scarce. 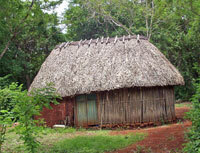 Sapotes were also valued by the Nicarao peoples of Nicaragua. 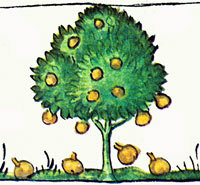 In Francisco Oviedo y Valdés’s sixteenth-century chronicle of their culture, he noted that their currency of cacao (chocolate) beans had established values. 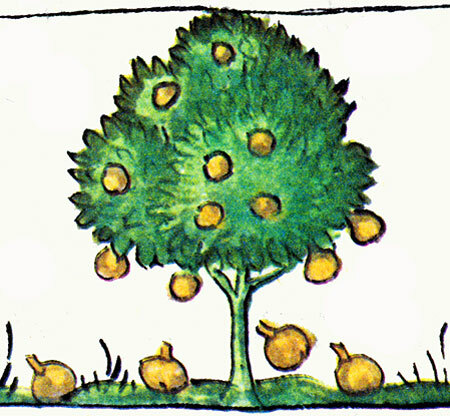 A buyer could obtain eight sapota fruits at the cost of four cacao beans, the purchase of a rabbit was ten beans, and a slave was worth one hundred. The sapodilla tree produces a wealth of natural products, including a latex that has been chewed in the Americas for centuries, a wood so durable that lintels from Classic-period Maya sites still exist, and a fruit that was worthy of bringing across the oceans to the Old World. 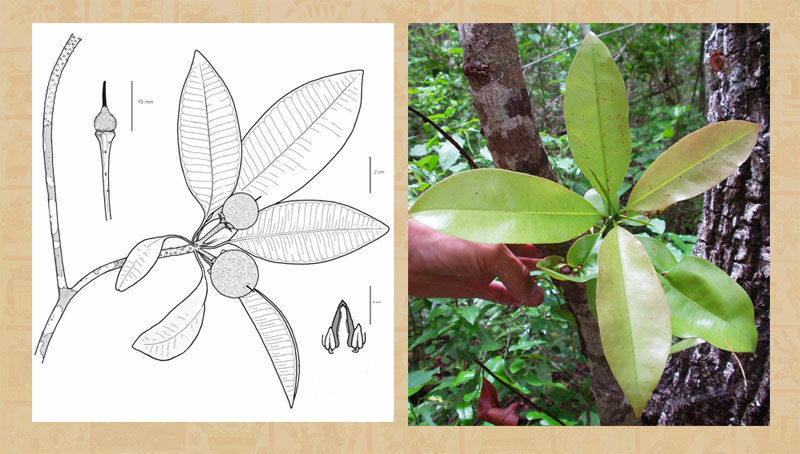 Ancient peoples bled the sapodilla tree of its latex much like they did the copal tree, or Bursera bipinnata (DC.) Engl. to obtain copal resin, and the rubber tree or Castilla elastica (Sessé ex Cerv.) to collect rubber. Due to its similar characteristics to these natural by-products, ancient Mesoamericans may have seen chicle latex in a comparable light—a valuable good that served both ritual and practical purposes. The ancient Mesoamerican perception of the landscape and the objects within it was multilayered and complex, and the same object or material such as copal, rubber, or chicle could serve multiple purposes. The ancient Maya burned copal in lump form in various types of wood, gourd, or ceramic incense burners, just as it is used today. When copal was burned, the smoke rose to the sky and provided a kind of sustenance for their deities—a “food of the gods.” The gods were also thought to come down to receive these offerings, which may explain “diving god” figures found with balls of copal in their hands (Picture 15). 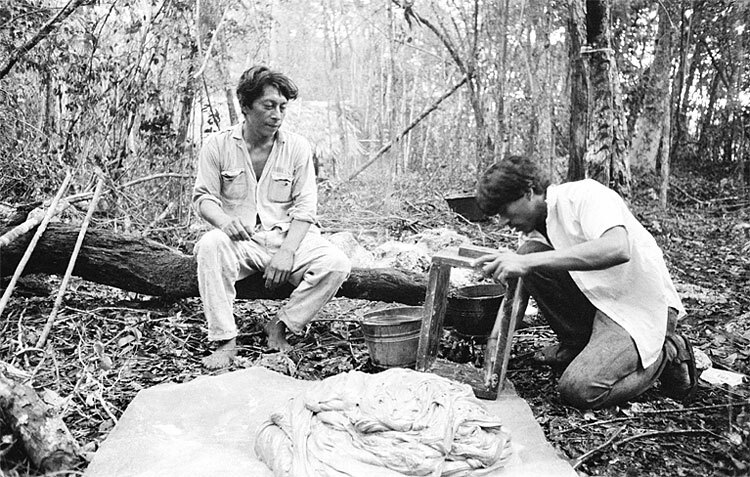 However, copal resin also served practical purposes. 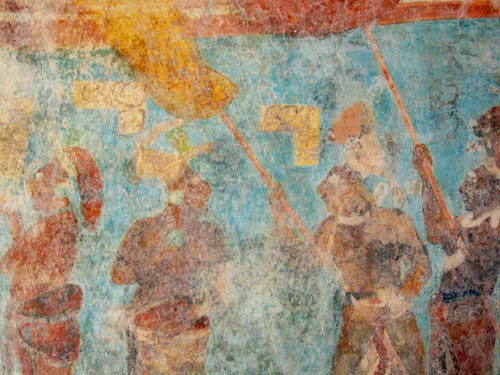 Ancient Maya artisans used a thin layer of copal to adhere cinnabar to greenstone objects and as a binder for the paint pigments used in the well-known murals at the site of Bonampak in Chiapas (Picture 16). 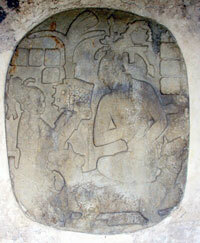 The resin was also used medicinally in pre-contact and colonial Yucatán to “warm the body” and to help cure headaches. Rubber latex was also a valuable commodity to ancient Mesoamericans that served multiple purposes. 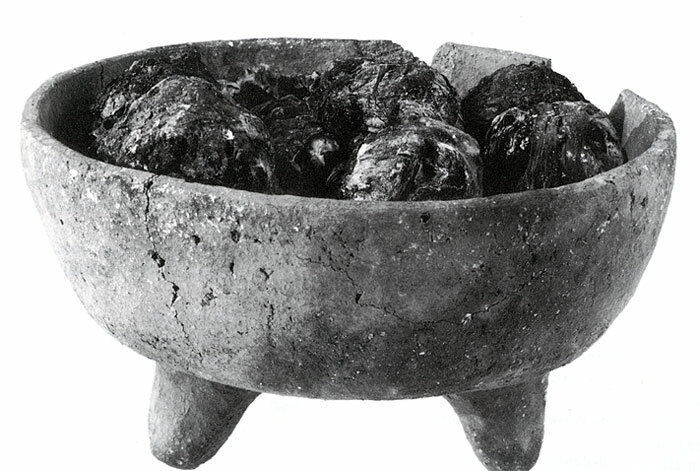 Numerous cultural groups including the Olmec, Maya, and Aztec used rubber to produce balls for the ritual ballgame (Picture 17), as well as for creating human figurines and body parts as sacrificial offerings. 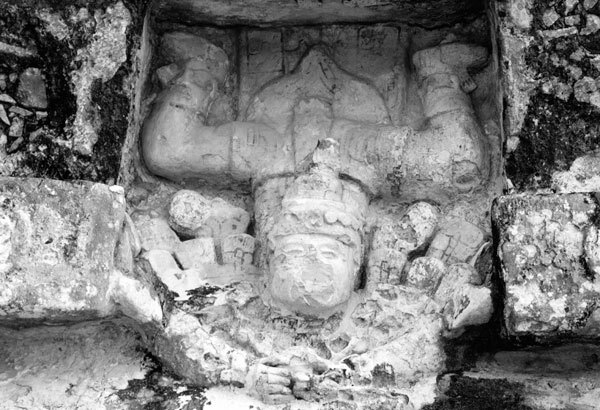 Archaeologists even dredged up a human skull incense burner with burned red rubber on the interior in Chichén Itzá’s Cenote of Sacrifice. 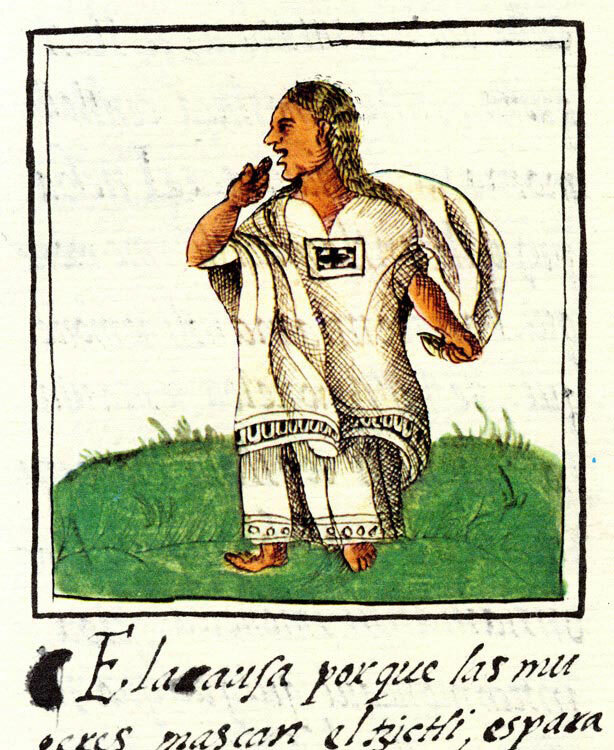 The chronicler Diego de Landa recorded that the Maya used rubber on the tips of drumsticks, which was likely preferred for the sound it produced while beating drums made of hollow logs. Ancient peoples valued rubber for its water-proofing qualities, and Fray Bernardino de Sahagun reported that the Aztecs even used it on the soles of sandals. The Aztecs also utilized rubber latex for its medicinal properties, including rubber drops that were put down the throat for curing hoarseness, ulcers in the ear, mixed with salt to the interior of the nostrils to cure dryness, and directly to lipsores. Ancient Mesoamericans saw copal and rubber as the “blood of the tree” and used it as a primary ingredient for creating offerings to their gods, as well as for everyday uses. It is quite likely that they similarly viewed chicle latex as a natural product that could serve ritual and practical purposes. While it was certainly not traded as widely nor was it as prevalent in ritual settings as copal and rubber, we know that the Maya have used chicle as a kind of incense, as well as wrapped it on the outside of ritual copal offerings (Picture 18). While some may argue that chicle serves a more utilitarian purpose (i.e., as a chewing gum, a sealant, and an additive that helps copal to burn easier), it seems that is a simplification of its use. The Maya often mixed objects such as jade beads, shell, rubber, maize, and cacao with copal, or even shaped rubber and copal resin into objects such as ears of corn or animal hearts. Chicle latex would have similarly crossed the boundaries and served multiple purposes. 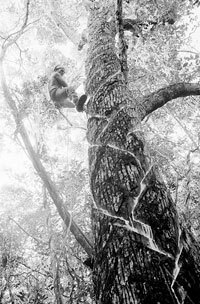 • Alcorn, P. W. 1994 The Chicle Tree (Manilkara zapota) in Northwest Belize: Natural History, Forest Floristics, and Management. Master’s thesis, University of Florida. • 2002 Botany and Ecology of Chicle. In Tapping the Green Market— Management and Certification of Non-Timber Forest Products, edited by Patricia Shanley, Alan R. Pierce, Sarah A. Laird, and Abraham Guillén, 49–59. London: Earthscan Publications. • Coe, Michael 1974 A Carved Wooden Box from the Classic Maya Civilization. In Primera Mesa Redonda de Palenque, pt. II, edited by Merle Greene Robison, 51–59. Pebble Beach, CA: Robert Louis Stevenson School of Pre-Columbian Art Research. • Coe, Sophie D., and Michael D. Coe 1996 The True History of Chocolate. London: Thames and Hudson. • Coe, William R., Edwin M. Shook, and Linton Satterthwaite 1961 Carved Wooden Lintels of Tikal. Tikal Report 6:15–112. Philadelphia: University of Pennsylvania, University Museum. • Coggins, Clemency Chase, and John M. Ladd 1992 Copal and Rubber Offerings. In Artifacts from the Cenote of Sacrifice, Chichén Itzá, Yucatán, edited by Clemency Chase Coggins, 345–357. Memoirs of the Peabody Museum of Archaeology and Ethnology, vol. 10, no. 3. • Dibble, Charles E., and Arthur J. O. Anderson, translators 1961 Book 10: The People (no. 14, part XI). In Florentine Codex: General History of the Things of New Spain. Santa Fe: Monographs of the School of American Research and the Museum of New México. •Hodge, Robert H. 1955 The Chewing Gum Tree. Natural History 64:74–80. • Langenheim, Jean H. 2003 Plant Resins: Chemistry, Evolution, Ecology, and Ethnobotany. Portland, OR: Timber Press. 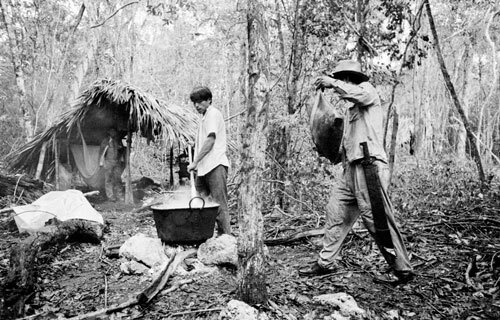 • Lundell, Cyrus L. 1933 Chicle Exploitation in the Sapodilla Forest of the Yucatán Peninsula. Field and Laboratory 2 (1): 15–21. • McCafferty, Sharisse D., and Geoffrey G. McCafferty 1991 Spinning and Weaving as Female Gender Identity in Post-Classic México. In Textile Traditions of Mesoamerica and the Andes: An Anthology, edited by Margot Blum Schevill, Janet Catherine Berlo, and Edward B. Dwyer, 19–49. New York City: Garland. • Simpson, B. B., and M. C. Ogorzaly 2001 Economic Botany: Plants in Our World. New York City: McGraw-Hill. • Tozzer, Alfred M. 1966 Landa’s Relación de las Cosas de Yucatán, a Translation. Millwood, NY: Kraus Reprint. Thoughtfully written, accurately researched. 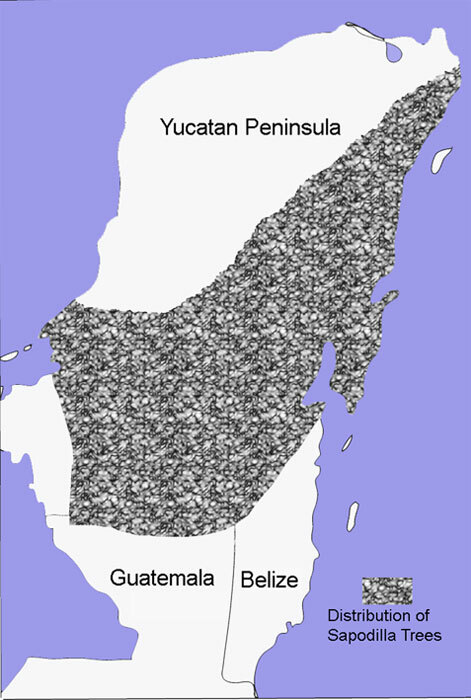 My father-in-law and brother-in-law were chicleros in Belize and Mexico. The book is a welcome addition to a past and renewing ethnic activity. Great article. I learned many things that I didn’t know.